International football is set for dire consequences if Fifa loses its court case with Charleroi, Sports Minister Richard Caborn has warned. Belgian club Charleroi, backed by G14, is suing Fifa in a bid for compensation for an injury to Abdelmajid Oulmers while playing for Morocco. 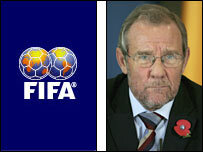 "In a decade African teams won't be in the World Cup if the decision goes the wrong way," said Richard Caborn. "The likes of Cameroon would not be able to afford to insure its players." Oulmers was sidelined for eight months after picking up an injury for Morocco against Burkina Faso in November 2004. A meeting between Fifa president Sepp Blatter and Charleroi chairman Abbas Bayat failed to find an agreement. So the club are taking the governing body to the European Court of Justice. The G14 group represents 18 of Europe's most powerful clubs and they are supporting Charleroi in their bid for compensation, as well as fighting a similar case for French side Olympique Lyon. Fifa has argued that it is up to the national associations to come to an agreement with the clubs over covering their players while on national duty. But Caborn, who was talking at the inaugural FT Sport Industry Summit, added: "If you think a lot of the African countries can pay for their players to come back from Europe - from the Bundesliga or from the Premier League - to play for their national teams and get paid for doing it - it's not going to happen. "It would have a profound effect on national sides. "It undermines international football. The most famous team in this country is the England team. In Cameroon it's the Cameroon national team. "You have to make sure that no matter where they play in the world they are accessible to go back and play for their national team." The G14 says Fifa has the financial powers to provide an insurance pool that could compensate clubs for players injured while on international duty.